This NASA - Cassini Spacecraft's Narrow-Angle Camera Image - one of those acquired during the Survey conducted by the Cassini Imaging Science Team of the Geyser Basin located at the South Pole of the Saturnian moon Enceladus - was taken as the NASA - Cassini Spacecraft was looking across the moon's South Pole and, at that time, the Spacecraft was essentially in the moon's Equatorial Plane. The image scale is roughly 1280 feet (such as about 390,144 meters) per pixel and the Sun-Enceladus-Cassini Spacecraft, or Phase, Angle was 162,5�. The image was taken through the Clear Filter of the Narrow Angle Camera on November, 30, 2010, such as 1,4 years after the Southern Autumnal Equinox. 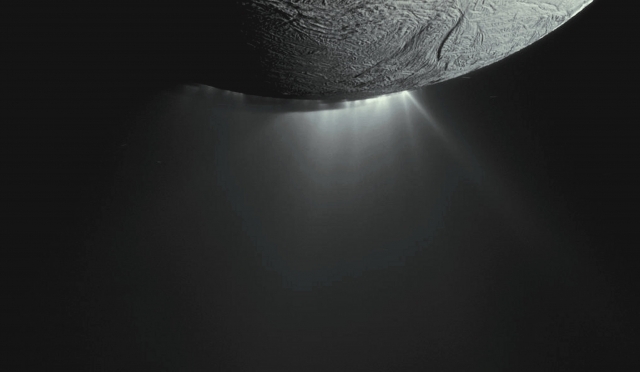 The shadow of the body of Enceladus - found on the lower portions of the Jets - is clearly visible here. Post-Equinox images like this one, since they clearly show the different Projected Locations of the Intersections between the Shadow and the Curtain of Jets coming from each one of the three (Main) South Polar Fractures of Enceladus (i.e. : Cairo, Baghdad and Damascus Sulci), were useful to Planetary Scientists in the work of checking the Triangulated Positions of the Geysers - as well described in an Abstract by Drr Porco, DiNino, and Nimmo, which was published in the online version of the Astronomical Journal of July 2014 (see http://dx.doi.org/10.1088/0004-6256/148/3/45). A companion paper, by Dr Nimmo et al. is also available at: http://dx.doi.org/10.1088/0004-6256/148/3/46. This frame (which is an Original NASA - CASSINI Spacecraft's b/w and NON Map-Projected image published on the NASA - Planetary Photojournal with the ID n. PIA 17184) has been additionally processed, contrast enhanced, magnified to aid the visibility of the details, Gamma corrected and then colorized - according to an educated guess (or, if you wish, an informed speculation) carried out by Dr Paolo C. Fienga - in Absolute Natural Colors (such as the colors that a human eye would actually perceive if someone were onboard the NASA - Cassini Spacecraft and then looked outside, towards the Saturnian moon "Enceladus"), by using an original technique created - and, in time, dramatically improved - by the Lunar Explorer Italia Team. Different colors, as well as different shades of the same color, mean, among other things, the existence of different Elements (Minerals) present on the Surface of Enceladus, each having a different Albedo (---> Reflectivity) and Chemical Composition. Note: it is possible (but we, as IPF, have no way to be one-hundred-percent sure of such a circumstance), that the actual luminosity of the South Polar Regions of Enceladus - as it is in this frame - would appear, to an average human eye, a little bit lower than it has been shown (or, better yet: interpreted) here.